Michael Jackson's Thriller has been overtaken as the all-time best-selling album in the US by the Eagles' greatest hits, and that band's album Hotel California is at number three. What is the spooky title track all about, asks Alan Connor. Rock stars of the 1970s were not kind to hotels. In Life's Been Good, sometime Eagles guitarist Joe Walsh describes the process bluntly. "I live in hotels, tear out the walls," he confesses: "I have accountants pay for it all." "It all" being a small fortune. In the official history of the band, Walsh recalls a single night at Chicago's Astor Towers in which he and Blues Brothers star John Belushi managed a $28,000 ( £22,000) damage bill. Among other bands, misuse of the hospitality industry was part of the legend - think of Led Zeppelin drummer John Bonham roaring down the corridors of Los Angeles' Continental Hyatt on a Harley Davidson he'd got for his birthday, or The Who's drummer Keith Moon, on his own birthday, ploughing a Lincoln Continental into the swimming pool of Flint Michigan's Holiday Inn. The senior Eagles, Glenn Frey and Don Henley, quietly tolerated Walsh's destruction but when it was their turn to write about what life on the road meant to them, the result was much less literal - and it made an enormous fortune rather than costing a small one. Don Henley had been playing with the phrase "Hotel California" for some time, but to become a song, it had to go through the regimented process the band had adopted by the mid-1970s. 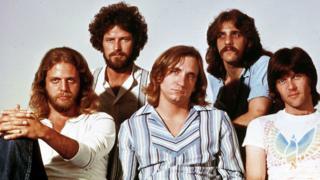 The Eagles were not yet at the point of communicating via lawyers, but they were referring to one another by surname. Another Eagles guitarist, Don Felder, was tasked with recording instrumental snatches onto tape and submitting them to Frey and Henley in hope of their approval. He had been doing this at home in Los Angeles' Topanga Canyon, but while on tour he took a call from his wife Susan, who had recently given birth. Media captionGlenn Frey talks about the significance of the Hotel California lyrics. It was a short call: "We're moving." Relaxing in their garden, she had noticed that the blanket she was lying on with the baby was next to a nest of rattlesnakes. Susan and son flew immediately to a rented beach house in Malibu; Don joined them and that evening duly began recording a suggestion for a song. A snake in an apparently idyllic garden is the kind of on-the-nose image that would have fitted right in with what his rhythm track was to become. The chords he strummed followed a pattern closer to flamenco than to rock, but played on the off-beat, which gave the song its working title of Mexican Reggae when Frey and Henley granted it the nod. As for the words the pair added, they describe a weary traveller who's lured into a "lovely place" of grotesque characters: it's glamorous and creepy and it seems he can never escape. A lot of imagination has been exerted in the last four decades trying to decode the song's images, or to assemble them into something coherent. It's probably worth bearing in mind Frey's words: "We decided to create something strange, just to see if we could do it." In other words, any meaning Hotel California has is unintended rather than hidden. The atmosphere of a man in an unfamiliar rural setting, unsure about what he's witnessing, mimics - says Frey - the 1965 novel The Magus. This early work of the English author John Fowles was a countercultural favourite for showing a secret world (in this case on a Greek island) where reality is suspect. It was, Fowles himself reckoned, not his best. "It is very far from being universally well written," he recalled. "I fell into almost every trap awaiting the tyro writer." A collage of weird images is a perfectly good way of creating a lyric; rock fans, though, being who they are, have preferred to search for specifics. The theories enthusiastically passed around are pretty much a summary of what regular folk suspected rock stars were up to: so "warm smell of colitas" equals marijuana, a face that you can't quite see on the sleeve is a notorious devil-worshipper and "you can check out any time you like, but you can never leave" proves that the "Hotel" is a psychiatric hospital, or addiction… or anything else that fits. "Vaguery is the primary tool of songwriters," Frey told a journalist during a 2003 pro-am golf tournament in California's Pebble Beach, where he was partnered with Huey Lewis. "It works, it means whatever the listener wants it to mean." The band never matched it again, and trying to do so drove them apart. And less fanciful listeners get out of the song a feeling rather than a meaning - that same loss of innocence which concludes that novel The Magus. And in the lines about being prisoners in a world of "pink champagne on ice", pleasure and regret mix in a way that's surely prescient. After all, when did you last hear of musicians trashing hotels? The last time may have been in 2004 when Busted's Matt Willis threw a television out of a window, then immediately apologised. And quite right too.